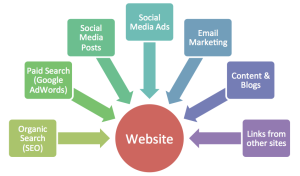 Your business has a website and a social media presence, but how can you leverage these online channels to ensure maximum effectiveness? Follow these five tips and increase your online customer business today. How are customers arriving at your website? Using online mediums such as social media, email marketing, Facebook marketing and Google Adwords can increase your business exponentially. These tools allow you to be more targeted and precise with your marketing and keep better track of your budget. They will allow you to see exactly how much you had to spend in order to receive a new lead. To make the most of these available mediums, follow these simple tips to acquire more customers and grow your business. Give your potential customers information that will help them make informed decisions within your particular industry. Have this article or e-book available for download on your website. All that they have to do is to enter their email address in order to receive it and you now have a very warm lead. Advertising on Google allows you to automatically appear as the top result in a search. Building your website’s organic SEO is a slow and costly process. With Google AdWords, you can instantly pay to appear at the top of Google search results. This makes your business more visible and the good news is that you only pay when someone clicks on the ad. You would be surprised at how much traffic to your website social media platforms can generate. One of the most helpful social media platforms in terms of SEO for a location based business is Google+. If you already have a list of current customers, then a regular email marketing campaign will help to re-engage them with your business. You can send your latest offers, company news and updates. Once again, you are able to see exactly how many people come over to your website and you can even see how many times certain people have opened your email. Certain email marketing tools allow you to then market specifically to these people. Online mediums can be an excellent avenue for growing your business, but you need to develop a strategy. A well developed strategy that is implemented consistently will produce outstanding results for your business. Online Uprising are a boutique online marketing company designed to help your business ‘Rise up and get noticed online’. If you would like to setup an obligation free Skype call with us, please enter your details below. We would love to learn more about your business, offer some advice and ultimately help you achieve your goals. Want to setup a Skype Call?